Childhood separation and loss have become virtually a way of life for a large number of children throughout the world. Children separated from their genetic parent(s) and consequently their genealogical, social and cultural roots due to processes such as adoption, parental divorce/separation, donor insemination, single parenthood by choice and child trafficking can face social, emotional and psychological difficulties. This book explores the premise that a proper understanding of the complex inner world of modern day separated children and their psycho-social development requires a shift in focus or emphasis. 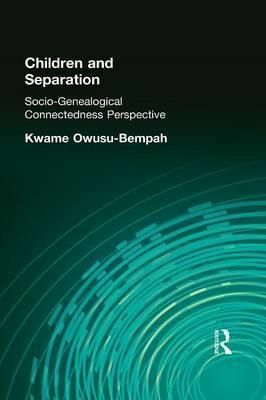 It presents the notion of socio-genealogical connectedness as a new theoretical framework for studying and promoting these children's growth and development. This new theory simultaneously challenges and complements existing notions of psycho-social development, including attachment theory and Erikson's psycho-social theory of personality development.